That time of year where couples get lovey dovey (or one forgets and the other hits the roof) is upon us again and for once I actually get to celebrate it! It's been a fair few years since I last bought a Valentine card or gift so I wanted to do something unique in case I don't celebrate another one for some time to come. 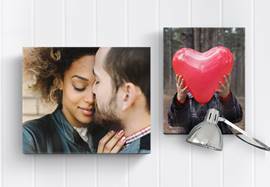 Snapfish have a great range of things from personalised canvases, mugs, photobooks and even cushions and mobile phone cases so I managed to get creative for a bargain. I designed some posters, acrylic magnets and these fab keyrings which we will use for each other's house keys. It took five minutes to create on their website and they arrived through my door only three days later which was really handy. 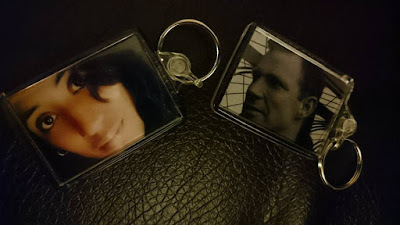 I've used the site before to create photo blocks of Chunk and Curly as well as magnets of various family and friends to decorate my fridge so I knew they would be good quality. You can also design your own Valentine cards using images and text of your choice as they have a range of templates and colours you can choose from. Unlike many other sites that offer similar products, Snapfish seems to be one of the lower-priced but also good quality ones, so I shall definitely be going back to them in a few weeks when Mother's Day approaches. The Bloke and I haven't been together for a hugely long time yet so I didn't have a massive amount of memories and photos to choose from, but I plan to try to take quite a few photos of us over the coming year so I can then create canvases or collages for next year's gift! Great post - i love snapfish!